And the Eats get Cheesier! Of course, attendees can get their fill of both fresh and hand-battered deep fried curds and gourmet dipping sauces at the festival’s Cheese Curd Central booth. Once again they’ll be serving them up three ways this year. There’s the classic, which is hand dipped in beer batter and fried. The Cinnamon Sugar Dessert Curds, which are a Cheese Curd Festival exclusive, will also be back; if a cheese curd and a mini donut had a love-child, this would be it. Plus, making their debut to the festival this year will be Ellsworth Cooperative Creamery’s newest specialty cheese curd flavor, Hickory Bacon! We’ll be frying them up in our famous beer batter! Cheese, beer and bacon… yes, with this curd we’ve got all the food groups covered! Holy Donuts spreads a little bit of heaven across Wisconsin in the form of delicious donuts! They are as close to heaven as you can get. After all, donuts have holes making them undeniably very hole-y. 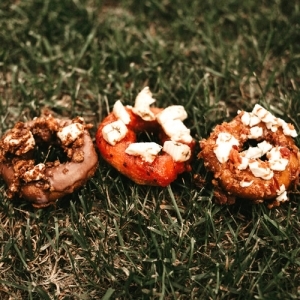 Holy Donuts are sold in boats and customers can mix and match any of their flavors. For the Cheese Curd Festival, their customers helped them decide on their donut and cheese curd flavor combinations: Anna’s Triple Chocolate n’ Cheese Donut (cheese curds dusted in chocolate crunch and generously topped with gooey chocolate glaze), Deb’s Bacon Breakfast Donut (sweet Midwest maple glaze underneath savory bacon and salty cheese curds), and the Ellsworth Pizza Donut (donut dipped in a secret marinara sauce and sprinkle a generous helping of Ellsworth’s Pizza Cheese Curds). Oh boy, this is a new one for the festival, and we can’t wait to try them! Bridget and Mary, co-owners of K&C Concessions, are often referred to by their customers as “The Sunshine Girls”! They have been a proud Cheese Curd Festival vendor for seven years now and when we put out the call out to our vendors for more cheese curd-infused dishes, they step up and wow us every time! This year cheese curd fans can look forward to their Deep-fried Cheese Curd Bacon Burger Kabob! They’ve got all the food groups covered with this one! And be sure to save room for their famous Loaded Cheese Curds, which have become a very popular and best-selling cheese curd dish! Of course, they’ll also be serving up their full menu of favorite festival foods. Oh, and don’t forget to ask Mary to sing her Ellsworth Cheese Curd Jingle for you! Smoky Treats BBQ fans! Yes, they’re back! It all started with a home smoker and a dream in 2016–simple, yet flavorful BBQ with fresh, local, and organic ingredients. They quickly became a fan favorite, not only at the Ellsworth Cheese Curd Festival, but the River Falls Bacon Bash, too, where they won the golden ticket to attend the World Food Championship! Their award-winning ABT’s (a.k.a A Beautiful Thing) has been a Cheese Curd Festival favorite since Smoky Treats first made their appearance at the festival in 2016. What is an ABT? 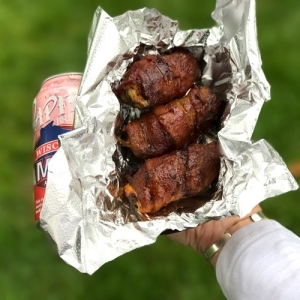 Close your eyes and image jalapeno peppers stuffed with Ellsworth Cheese Curds and chorizo sausage, then wrapped in bacon and slathered with Croix Valley’s Blue-B-Que sauce, all smoked to perfection. Is your mouth watering yet? This dish has been recognized as both a Festival Favorite and People’s Choice winner! They’ll also be bringing back their Pulled Pork Poutine… French fries topped with smoked pulled pork, smoked gravy, and Ellsworth Cheese Curds. Yum! New to the festival this year is Nick Kaufenberg’s The Big Cheese. Nick and his team will be bringing you gourmet, hand-crafted grilled cheese sandwiches and other cheesy cuisine. They use the best in locally sourced ingredients that are in season and of high quality. Schmoosh some Ellsworth Cheese Curds into those cheesy sandwiches and you’ll soon taste why we had to have him at the Cheese Curd Festival! 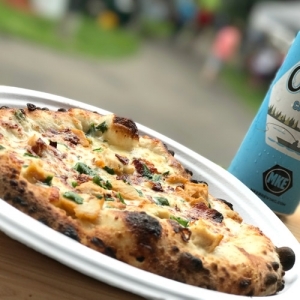 And that’s not all… you’ll get your fill of these, along with your favorite Sconnie BBQ, brick oven pizzas, and more delicious cheese curd dishes along Food Truck Alley! Learn more about the festival’s food and beverages here. As you can tell, this isn’t a time for dieting—Grab a handful of napkins and have your fill because this festival only comes once a year! Don’t forget to make tasting notes. We need you to help us choose the 2018 People’s Choice winner! No early voting… you’ve gotta taste the foods first. Instructions will be announced at the festival. Ellsworth’s Cheese Curd Festival is held each year in June and celebrates our town’s designation as the Cheese Curd Capital of Wisconsin and those tasty white morsels which have earned world-wide acclaim. The Festival with Music on the Side Cheese Curd Festival 2018: Let’s Reminisce, Shall We?